With a Samoan dad, I learned how to make graduation leis when I was young. While us kids were relegated to making candy leis or ribbon leis, my dad and mom would make the special flower leis for graduation ceremonies. In recent years, the tradition of giving graduation leis has really grown across the US and around the world. As a result more and more people want to know how to make graduation leis to give to their loved ones. Here on our site you’ll find many tutorials on how to make all kinds of leis from Starburst leis to Werther’s leis, we’ve created tutorials for a variety of options. If you’d like to make a basic graduation lei or are in search of some good places to buy one keep on reading. For the longest time, graduation leis were only common in the beautiful island of Hawaii. But over the years, this beautiful tradition has spread to every state in America and other continents, with people looking for the most beautiful graduation leis for their children and friends. Giving graduation leis to high school or university graduates represents our love and affection for them. At the same time, the use of leis in graduations also represents the transition from university life and the beginning of a new chapter for the individual and could be seen as a way of wishing the graduate good luck and love, as they transition to the next stage of their life. There are different types of graduation leis used in graduations, However, the flower leis are the most common types of leis, but other popular options include candy leis, leaf leis, and ribbon leis. The orchid lei is the most common type of lei presented graduates in the mainland. They are loved by just about everyone, which is why their supply drops significantly in the months leading up to graduation season. So, if I were you, I’d recommend that you place your order for the orchid lei months in advance. The orchid leis are all beautiful and available in different colors from lavender and cream. 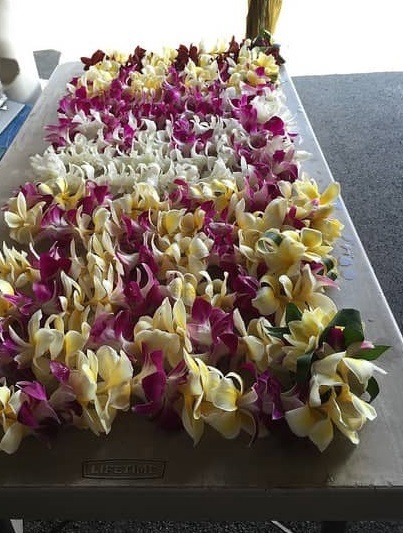 To ensure that they last long and remain fresh on graduation day, leis typically come with instructions for care. 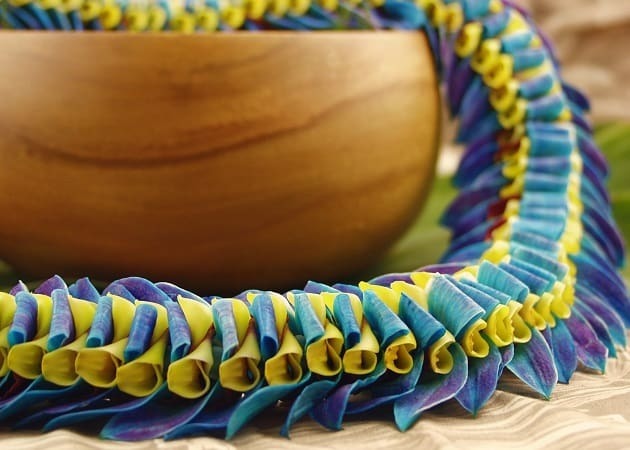 These are the intricately braided leis which are created in beautiful and unique designs typically from a ribbon. Woven leis will typically be made using a graduates school colors. While many woven leis are made from ribbon, you’ll also find unique woven leis made from flowers. Looking for a graduation lei that matches the color of your university or college? Try the color infused leis. These leis are made using flowers that are dyed to match specific school colors. Many companies that sell leis will let you select the colors you’d like to use. As the name suggests, the fragrant lei comes with a wide array of wonderful aromas. Different fragrant leis have different aromas, and you get to choose an aroma that your loved one will like. Leaf leis are made of leaves instead of flowers, and they are believed to bring good luck. 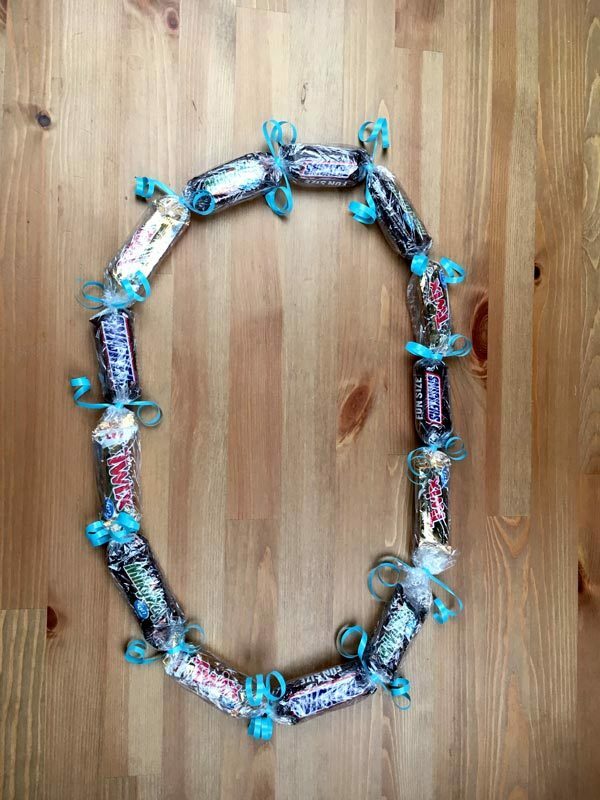 They are the most common types of leis for men, and they are a great way for you to send off your loved one on their journey and as they embark on life after graduation. Another popular option, especially for those particularly long graduation ceremonies is the candy lei. 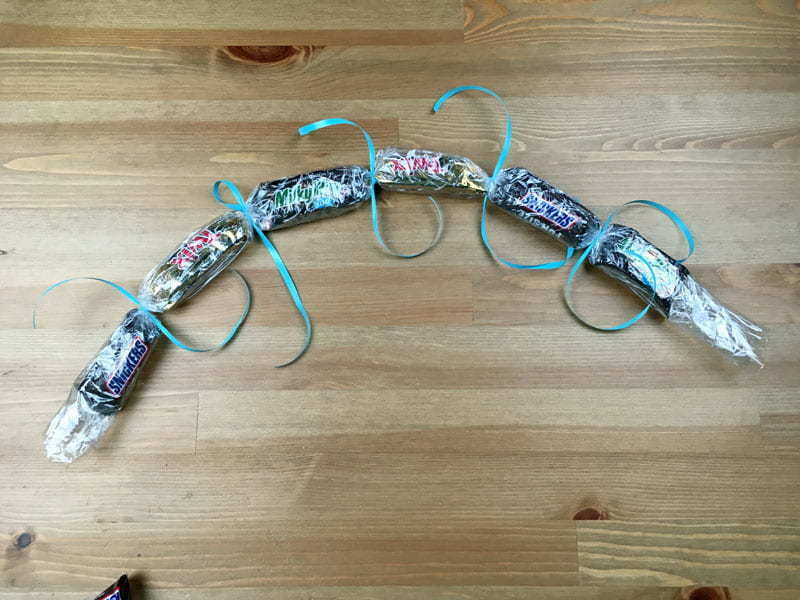 Candy leis are quite easy to make and should definitely be filled with the graduate’s favorite candy. Just be careful with what candies you include. If it’s going to be a hot ceremony outside you may want to skip the chocolate as it’s going to end up a bit of a mess. Hard candies are usually a bit better for candy leis. Let your graduate look a few bucks richer with a money lei made with crisp dollar bills. 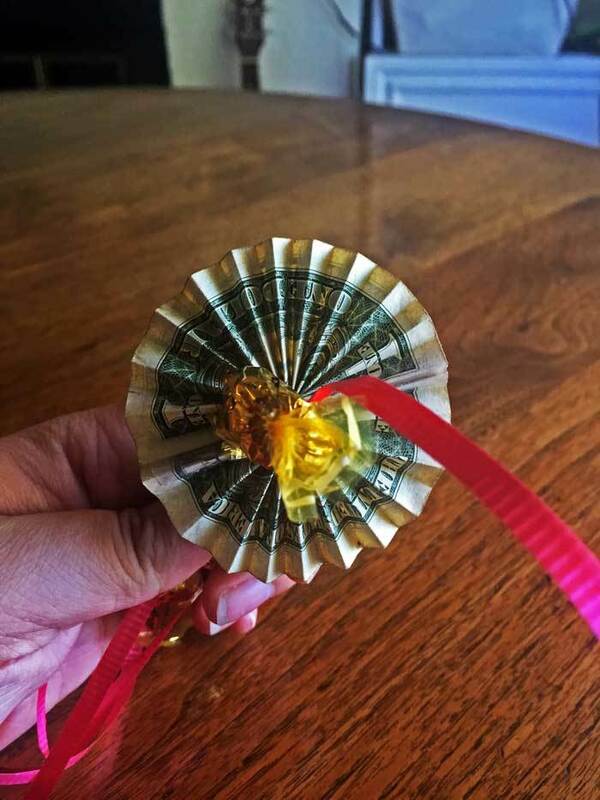 The money lei is easy to make, and all you need is some dollar bills, scissors, balloon curling ribbon, wrapping ribbon, and invisible tape. We normally made a candy lei or ribbon lei and then added money to the lei. You could also order money leis online. If you want a graduation lei that will last forever, get an origami lei. It’s made with colored paper matching the school colors, and the paper could be shaped into flowers. 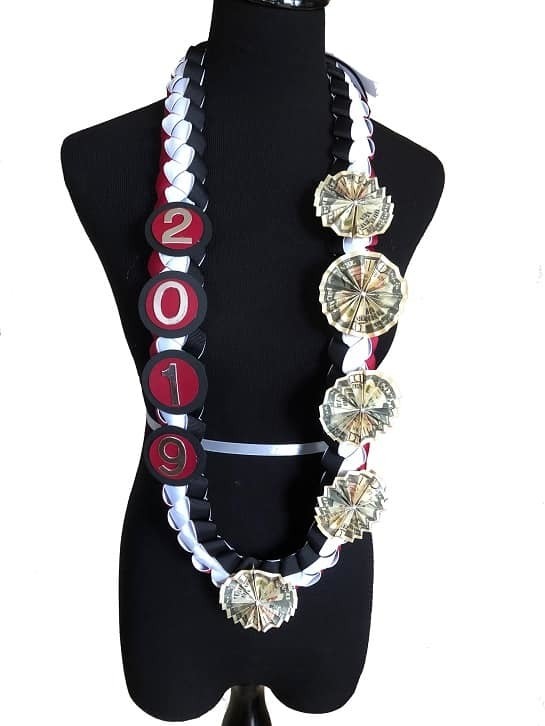 If you’re not up for making your own graduation lei there are quite a few places online you can order a lei in advance. If you’d rather see the lei in person, there are often people at graduation ceremonies selling them. You can also reach out to local floral shops to try and purchase leis as well. When ordering a flower lei online be prepared for potentially higher shipping costs than most other businesses. 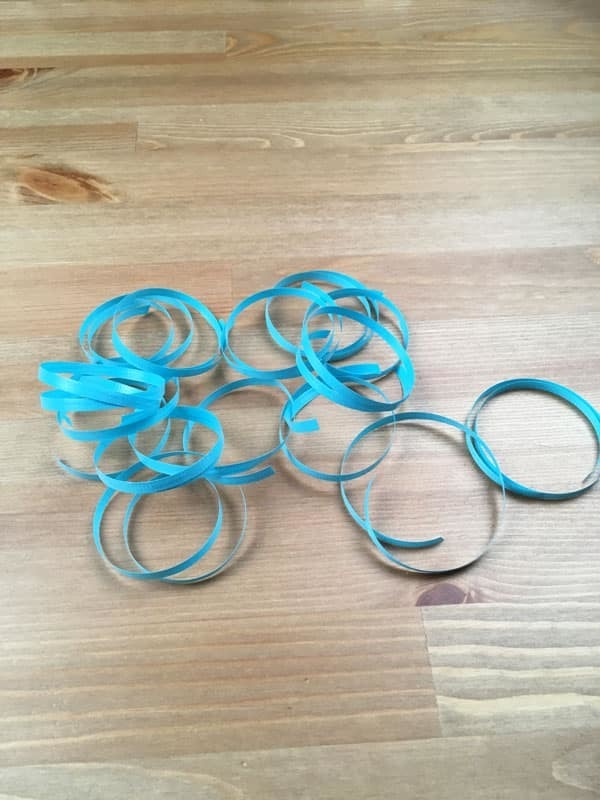 lower leis really can’t easily sit in a box for a week and come out looking perfect so 2nd day shipping is often the slowest option you can select. This is probably my favorite place to purchase graduation leis. There are many different sellers and you can often get the lei personalized for your grad. If you’re looking to get a beautiful flower lei direct from Hawaii this is a fantastic option. Hawaii Flower Lei has so many amazing options it’s hard to pick just one. Whether you’re shopping for a simple leaf lei or a stunning braided orchid lei they have it all. This is another great place to shop for stunning flower leis. Aloha Island Lei is a family business that ships leis across the country. They also have a wide selection of flower and nut leis. One of my favorites is the Waipio pictured below. You can shop on their website or Etsy shop. 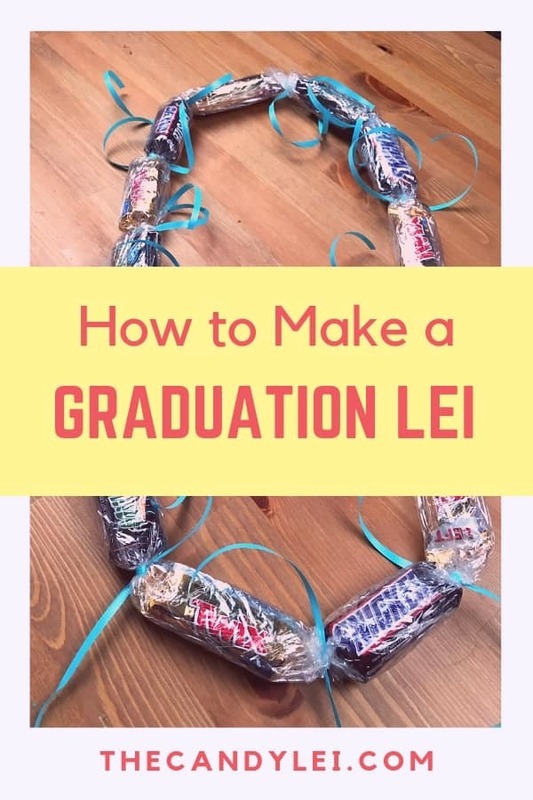 If you’re interested in making your own graduation candy lei, this quick and easy tutorial will walk you through all of the steps. And if you feel like getting a little fancier you can check out some of our other candy lei tutorial like braiding a gummy worm lei or making a starburst lei. Candy of your choice (while this one is made of chocolate remember that if the grad ceremony is outside this will probably melt). Roll out your saran wrap or cellophane so you have about 18″-24″ and cut it. 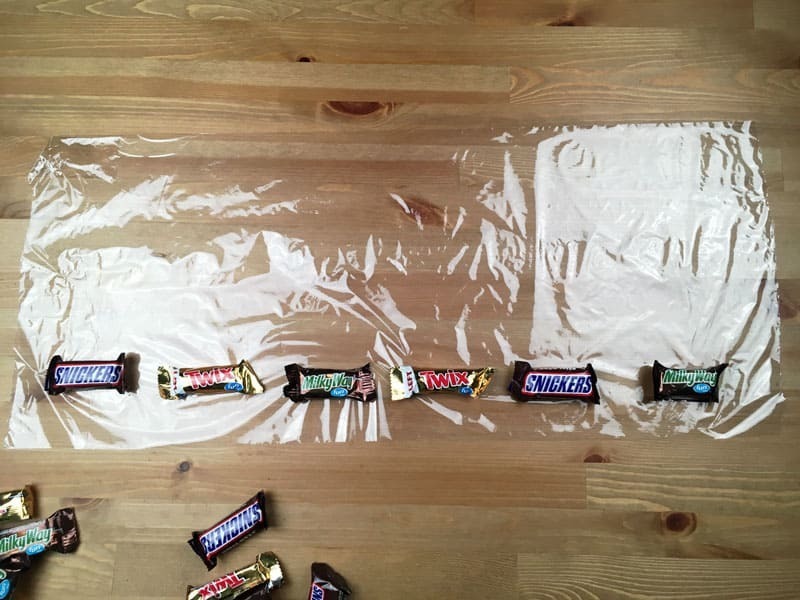 Then lay out your candy leaving just under an inch in between each piece. 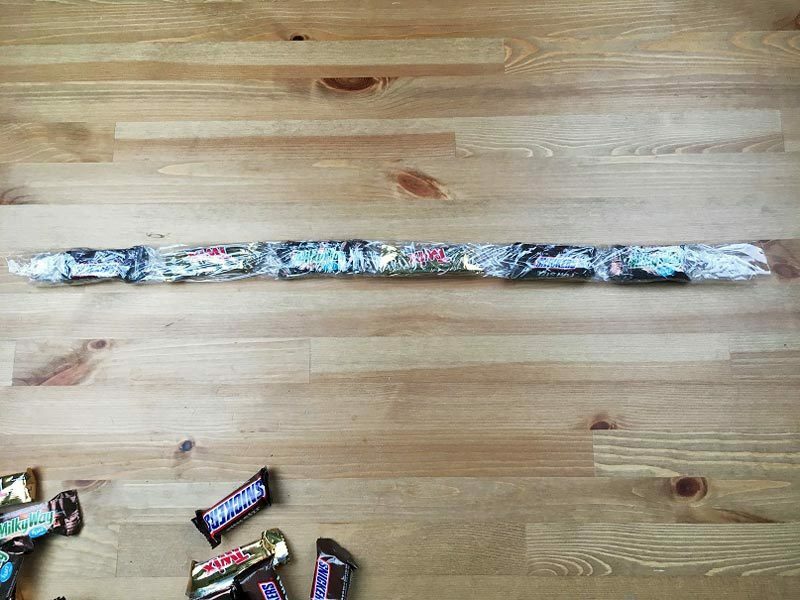 As shown in the picture, you’ll want to leave a little bit of saran wrap below the candy. Fold the saran wrap up over the candy and then slowly roll up the saran wrap. 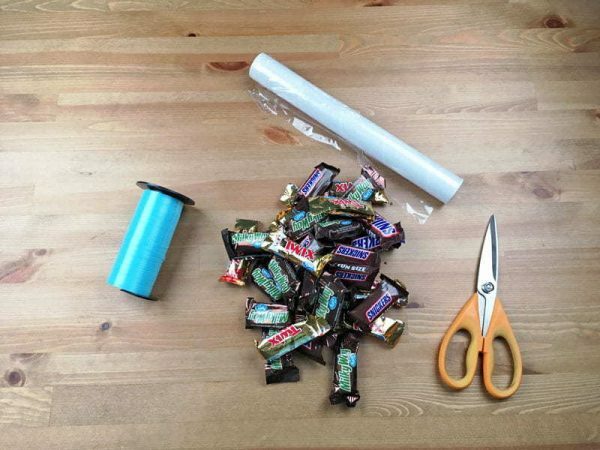 To get it started it’s easiest to fold each piece of candy up in the saran wrap. Once you have one rotation in you can roll it all up pretty easy. Once you’ve rolled it up repeat steps one and two to create the other half of the lei. 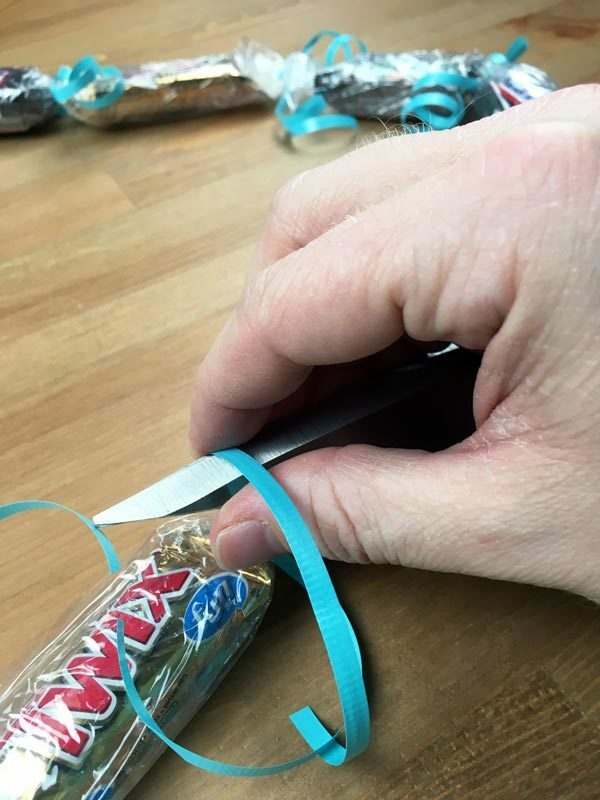 Cut the ribbons about 9 inches long and then tie one in between each candy. Lastly, you’ll tie the two halves together to complete your lei. The last thing you need to do is use the scissors to curl the ribbon. To do this, use your thumb to press the ribbon against the edge of the scissors. Apply pressure to the ribbon and slide it across the scissors, this will curl the ribbon. And there you have it, you’ve completed your graduation lei!